KUALA LUMPUR (Jan 5): Based on corporate announcements and newsflow today, companies that may be in focus tomorrow (Tuesday, Jan 6) could include the following: WZ Satu Bhd, Malaysia Airports Holdings Bhd (MAHB), Eversendai Corporation Bhd, Alam Maritim Resources Bhd, Borneo Oil Bhd, IHH Healthcare Bhd, Century Logistics Holdings Bhd and OCK Group Bhd. WZ Satu Bhd’s Heads of Agreement (HOA) to fully acquire oil and gas support services provider UBF Maintenance Sdn Bhd for RM79 million, under a cash and share deal from Khairul Anuar Mohd Nor, Datuk Leom Joo Deck, Cheong Cheng Kee and Wong Ka Tiang, has lapsed. In a filing with Bursa Malaysia today, WZ Satu said after due deliberation, its board of directors has resolved not to extend the validity of the HOA, as an agreement on the terms of the proposed acquisition could not be agreed upon, between the group and the vendors. WZ Satu had on Nov 6, 2014, signed an HOA with Khairul Anuar, Leom, Cheong and Wong to acquire 1.5 million shares, representing a 100% stake in UBF, and had stated the HOA was expected to lead to a share sale agreement. WZ Satu shares closed down 2 sen today to RM1.68, giving it a market capitalisation of RM421.82 million. Malaysia Airports Holdings Bhd (MAHB) will now pay €279.23 million for the remaining 40% stake in Sabiha Gokcen International Airport (ISG) and LGM Havalimani Isletmeleri Ticaret ve Turizm (LGM), 2% less than the original sum of €285 million. In a statement today, the airport operator said it has completed the acquisitions from the Limak group. "The total cash consideration for the acquisitions was adjusted in accordance with the provisions of the SPA (sales and purchase agreement) from €285 million to €279.23 million," MAHB said in a filing with Bursa Malaysia. MAHB shares closed down 19 sen or 2.84% to RM6.51 today, for a market capitalisation of RM8.94 billion. Eversendai Corporation Bhd has landed a construction contract worth RM44 million in Dubai. In a statement Monday, the company said its subsidiary had secured the Nas Arena contract for the structural and steel works of the Nas Indoor Futsal and Volleyball Arena. Eversendai chairman and group managing director Tan Sri A K Nathan said the company was leveraging on its reputation to bid for upcoming projects in line with the Dubai World Expo 2020, and to simultaneously strengthen its position as a global player in the booming construction market in the Middle East region. Its shares closed down 0.5 sen or 0.88% to 56.5 sen today, for a market capitalisation of RM437.25 million. Alam Maritim Resources Bhd today announced it had incorporated a joint venture company in Labuan with Vallianz International Pte Ltd (VIPL), for the purpose of owning offshore support vessels that operate in Malaysia’s upstream market. According to Alam Maritim’s filing with Bursa Malaysia this evening, its wholly-owned subsidiary Alam Maritim Investment Holdings (L) Inc (AMIH) had entered into a shareholders’ agreement with VIPL, a wholly-owned subsidiary of Vallianz Holdings Ltd, which is listed on the Catalist of Singapore Exchange. The principal activities of the joint venture company, Deepsea Leader Venture (L) Inc (Deepsea), are ship management and operation, ship owning, ship maintenance and marine consultancy. AMIH owns 51% stake of Deepsea, while the remaining 49% is owned by VIPL. Alam Maritim’s board of directors also mentioned the collaboration is expected to contribute positively to the earnings and net tangible assets of the group, for the year ending Dec 31, 2015 (FY15) and beyond. The marine support services provider was traded 4.5 sen or 6.87% lower today, ending at 61 sen at market close, valuing the group at RM563.92 million. Borneo Oil Bhd’s wholly-owned unit Borneo Oil and Gas Corp Sdn Bhd (BOG) has been appointed by Jusra Mining Merapoh Sdn Bhd (JMM) to carry out gold mining in an area measuring 202.8 ha in Sungai Serumbum, Pahang. Under the sub-contract, BOG will be involved in the prospecting, exploration and mining of alluvial and lode gold, on an exclusive basis in the designated area, for a period of five years; and renewable for another five years, subject to a review. The estimated contract value cannot be readily quantified, as it depends on "the production quantity of gold ores, sales price of gold, and rates of tribute payable involved,” said Borneo Oil in a filing with Bursa Malaysia. Going forward, in the event any further mining leases and permits are approved by the Pahang state government to JMM, BOG will be exclusively appointed to carry out the mining works. Borneo Oil closed 1.5 sen or 1.64% higher at 93 sen, bringing its market capitalisation to RM316.12 million. IHH Healthcare Bhd has denied a newspaper report that it is acquiring a stake in Bangkok Dusit Medical Services PCL, Thailand's largest listed hospital operator. IHH Healthcare told Bursa Malaysia today, "after having made due enquiries with all the directors and the relevant major shareholders of the company, [it] wish[es] to announce that IHH has no intention to acquire an 11.5% associate stake in Bangkok Dusit, at this juncture". Its statement was in response to an article in a local daily today, that said it was eyeing the Thai hospital operator. Quoting sources, the daily had reported the acquisition could be funded by a combination of cash and an issuance of new shares. It said the 11.5% stake in the Thai hospital operator has a market value of 30.64 billion baht (RM3.27 billion), based on the company’s shares at 17.20 baht each on Friday (Jan 2). IHH Healthcare closed at RM4.73, down 7 sen or 1.46%, giving it a market capitalisation of RM38.68 billion. Century Logistics Holdings Bhd's major shareholders have reiterated they will take the lead to charge ahead and ensure continued growth of the group in the years to come. "The leadership for this charge will come from both (Century Logistics' executive chairman) Datuk Phua Sin Mo, and (managing director) Teow Choo Hing," it said in a filing with Bursa Malaysia today. 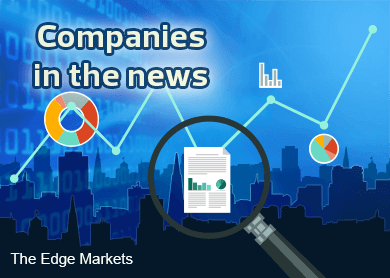 Century Logistics was commenting on a news report by The Edge Financial Daily today, which said, citing unnamed sources, that the group's major shareholders who collectively hold about 44%, were looking to sell their equity interest in the supply chain management and logistics provider. It added that after due inquiry on the group's major shareholders — Phua, Teow and former executive director Teow Choo Chuan (who resigned from the post on Aug 14, 2014) — they currently have no intention of selling their equity interests in Century Logistics. Shares of Century Logistics closed up 4.8% or 3 sen to 65.5 sen today, giving it a market capitalisation of RM236.19 million. Telecommunications network services provider OCK Group Bhd has appointed Yap Wai Khee as its new chief executive officer (CEO). In a filing with Bursa Malaysia today, OCK said Yap, 47, has over 21 years of experience in strategy and commercials, with 16 years in the telecommunications industry. It said Yap has been in several senior management roles for telecommunication companies in the region, and has had experience managing regional projects in Cambodia and Myanmar. Previously, he was the head of strategy and analysis of Axiata Group Bhd, [and] chief operating officer and a member of the executive committee (ExCo) of U Mobile Sdn Bhd, and CEO of Mfone Co Ltd (Cambodia). "Prior to joining OCK, he was the chief strategy officer of Robi Axiata Ltd in Bangladesh,” it added. The counter closed the day at 74 sen, after shedding 5.5 sen or 6.92%, giving it a market capitalisation of RM390.84 million.